Casper/Proof-of-Stake (PoS) refers to proposed blockchain consensus-building algorithms and processes, which are set to become the operational backbone of Ethereum 2.0, the long-anticipated successor to Ethereum 1.0. In basic terms, the PoS approach to scaling asks blockchain validators to put skin in the game; if validators form cartels or do other things that harm the network, they get burned. PoS is not limited to Ethereum; even within Ethereum, there are several competing PoS proposals (see here or here). But insofar as Ethereum represents the largest active global public blockchain development project (by reference to number of developers, active projects, adoption, etc. ), this article will use Ethereum’s transition to PoS as a case study. The analytical takeaways here translate more broadly however. Thesis A: To understand how PoS will work legally, we must understand the current legal frameworks behind PoW. Thesis B: The legal structure of proof-of-stake (PoS) blockchains is qualitatively different and far more complex than the legal frameworks for proof-of-work (PoW) consensus — which are themselves indeterminate and increasingly complex. Thesis C: Rigorous legal stress tests offer layers of additional security to global proof-of-stake blockchains. 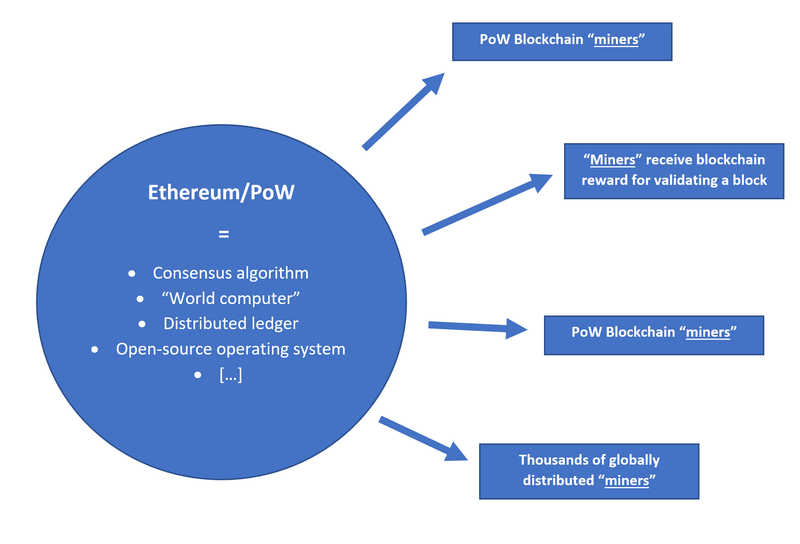 By way of brief background, today’s Ethereum employs a so-called Proof-of-Work (PoW) consensus-building process. In a PoW blockchain validation scheme, volunteers are incentivized to run specialized blockchain “mining” software on their computers. The blockchain node software then creates a fixed record of all transactions occurring on the blockchain, and works to update the blockchain for as long as the software is run. There are many other subtle nuances of the Ethereum 1.0/1.X design, including so-called “Uncle” rewards, “gas” fees for validating transactions depending on the extent of one’s usage of the blockchain, and different connections to specialized transactional protocols (e.g., 0x, Polkadot, etc.) — not to mention a long and growing catalog of “smart contracts,” dApps, and DAOs built or planned for Ethereum. Cumulatively, Ethereum’s blockchain app/platform tools permit the deployment of an asymptotically infinite range of global financial instruments. Yet Ethereum is not a financial or cryptocurrency network, strictly speaking. Ethereum is best thought of as a database, a network, an operating system, and a collection of interoperable programming languages. Whether we think of Ethereum as the world’s slowest supercomputer or a crypto network, blockchains like Ethereum are the foundation of a more secure and equitable Internet. This is why it is so important to put existing and upcoming chains on the strongest possible legal footing. Despite the impressive set of characteristics above, Ethereum needs a radical redesign to become a rapidly scalable general-purpose global public blockchain. PoS is that radical redesign. PoS seeks to fix the following core problems with PoW, among others. If adoption rates continue to scale exponentially, computing capacity cannot keep up, leading to higher transaction times and/or higher fees charged by node operators in exchange for more computing bandwidth. This outcome is not optimal because it presents an uncertain development climate — firms will not invest resources in developing, say, ETH-reward apps if they cannot adequately forecast the cost of scaling to billions of users and billions of daily transactions on increasingly congested networks. On the other hand, if adoption rates are artificially controlled and effectively depressed to track existing operational bandwidth, then Ethereum runs a high risk of being outpaced by a competing blockchain that offers higher transaction volumes, faster transaction times, and lower overall fees. Among other claimed advantages, PoS offers a more rational (and, hence, more quantifiable and predictable) approach to blockchain transaction cost scaling. Second, PoW mechanisms are proving easy to capture. Even large putatively-decentralized blockchains like Ethereum and Ethereum Classic are always at risk of the dreaded 51% attack. Concentrated mining power (including the on-the-ground reality of mining pools) means that a large part of the global base of node operators is, functionally, a fluid network of cartels and factions, each vying for primacy vis-a-vis the other. For theorists and visual learners, Wassim Alsindi’s ongoing Forkonomy project is a brilliant illustration of the fragility of this part of PoW. Third, PoW hashing is extremely energy hungry, which means that PoW blockchains like Bitcoin and Ethereum consume an increasingly large share of a presently-finite planetary thermodynamic pie. Until they offer material hyperutility, PoW blockchains remain open to legal attacks on variously-styled crypto-environmentalist and related policy grounds. Transitioning to PoS allows PoW developers to offset mounting regulatory scrutiny, while delivering consensus/validation mechanisms that do not destroy the planet. Fewer externalities → lower liability. Fourth, the hope of blockchain validation on a spare desktop PC is quickly giving way to the reality of BigCrypto — powerful hardware and software collectives determined to write the future operating rules of the New Internet. This impacts all blockchain projects, including Ethereum. To preempt capture by powerful incumbents, blockchain developers must maintain vigilance in a vicious defensive cycle. 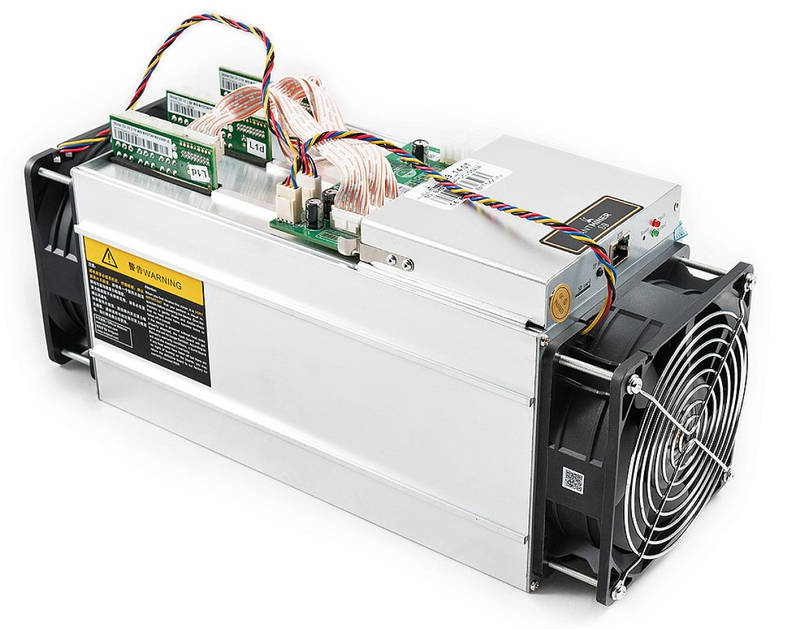 For example, developers must expend significant resources to revise PoW hashing algorithms to resist so-called ASIC-miners (mining hardware that uses Application-Specific Integrated Circuits, e.g., a machine custom-built to do nothing other than, say, mine Ether). The bottom line here is that a maximalist PoW posture means permitting brute force to rule the day. In this blockchain reality, might makes right. For coders committed to building a more-or-less equitable networked transactional space, might-makes-right is not a viable strategy. Hence, in part, the transition to PoS. The context above shows what motivates the shift from PoW → PoS, and some of the jargon involved. To understand the legal requirements for PoS, we can now narrow our focus to some of the core legal forms underpinning PoW. One of the most significant PoW features is the mechanism of block validation by purportedly decentralized volunteer armies of (mainly, pooled) miners. Insofar as elimination of mining is a key innovation of PoS over PoW, we must take time to understand how the PoW reward mechanisms work legally — and what they’re being replaced with. Like much of crypto law, this area remains grossly under-theorized. One reason this area is so under-analyzed is information overload, including a growing set of global and domestic legal prisms through which to analyze blockchains. Mindful of the challenges, here are three possible starting points for PoW legal analysis. One way of analyzing PoW is to place it completely outside of existing legal regimes (PoW [Bitcoin, Ethereum 1.0, et al.] = alegal), and to maintain the experimental, research-focused, and voluntarist nature of the enterprise. 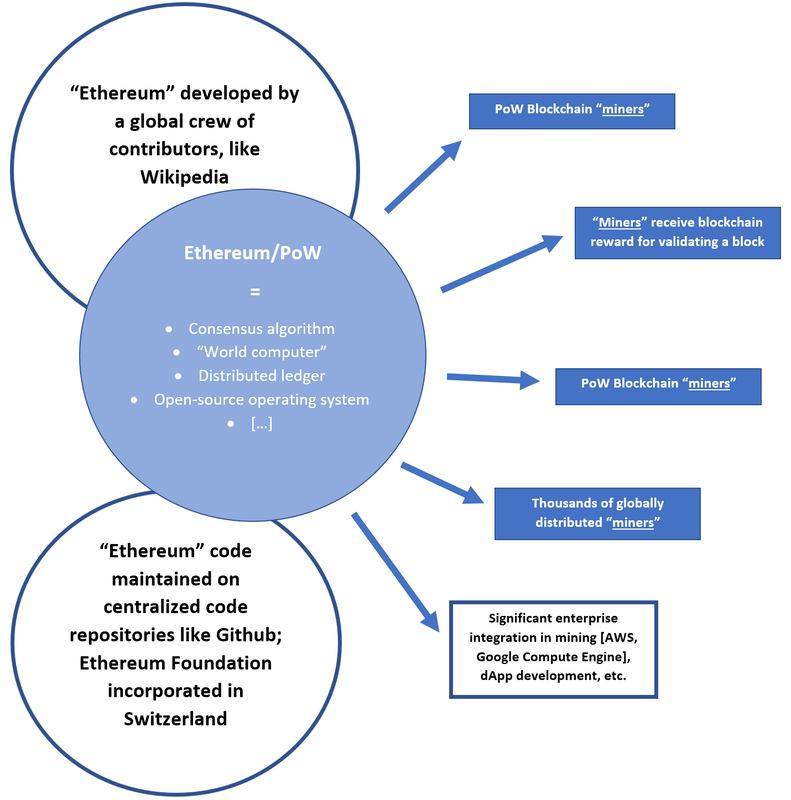 That is, despite accelerating adoption by BigTech and FinTech players, Ethereum remains largely a volunteer research project whose goal is, first and foremost, to design and perfect consensus-building algorithms and processes. In this view, legal analysis of PoW mining rewards (for example) is impossible and inadvisable. There are too many jurisdictions to wrestle with; too many variables to account for; and, in any event, the whole point is to move away from existing legal strictures. Of course, any move along the legal ←→ alegal spectrum entails corresponding spooky action at a distance along the legal ←→ illegal spectrum. Alegality, in other words, is never fully alegal. Another way of analyzing PoW is to analogize PoW to settled property law regimes. In this view of PoW, node operators can be viewed like landlords of computer farms who lease out their computing power in exchange for fees. Property law theory offers rich analogical fodder for this vision of crypto and both PoW & PoS blockchains. Another mainstream way of analyzing PoW focuses on the legal nature of the crypto form in question — such as the well-known Howey test for determining whether a given crypto instrument is a “security” versus “utility” token. This analytical vector also encompasses the ongoing domestic debates over the very nature of crypto as reward, coin, token, currency, money, and so forth. Extending this to PoS, we would ask whether the new staking tokens on, say, Ethereum 2.0 would fall within existing boxes, or potentially represent a sui generis category of crypto instruments. These are just three entry points, of many. Here’s the key interim takeaway: the legal contours of Ethereum’s current PoW scheme have not been tested legally, let alone settled. If we broaden the aperture, we get the same picture. Despite growing calls for regulatory intervention into crypto, the legality of ETH as cryptocurrency, digital asset, and/or contract has not been definitively decided (if, in fact, it’s ever possible to get definitive legal guidance on paradigm-shifting technologies). This presents big potential problems, but also immense opportunities. By this point, we see that even relatively straightforward PoW schemes are complicated legal beasts. Yet blockchain legal forms are complicated even more by extreme versions of “write your own law” (aka freedom of contract). This is the idea that blockchain participants can completely extricate themselves from preexisting legal norms, processes, and institutions and achieve alegality by using bedrock legal forms like contract. We observe a similar trend with the contractization of property law in serious blockchain projects like Mattereum. Given the centrality of contract theories of obligation in crypto, we must examine potential contractual linkages in PoW/PoS in much greater detail. This is also useful because contract law offers much more familiar legal frameworks for thinking about blockchain rewards than more abstract concepts like, say, alegality. Here’s a very simplified diagram for thinking about potential lines of contractual privity in a PoW context (arrows represent potential contracts). 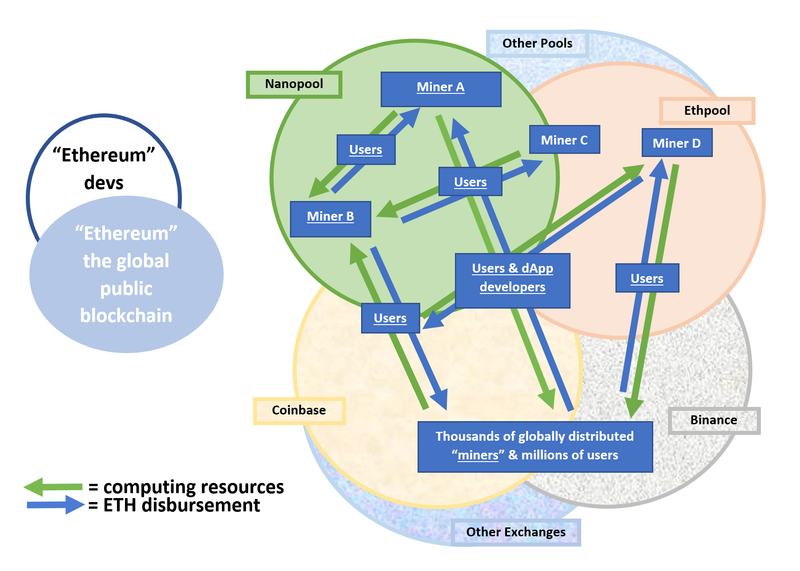 In this scheme, what one sees is a central hub, often referred to as “Ethereum” — and radiating spokes of miners, users, and other members of the global Ethereum community. The arrows project outwards to correspond to the disbursement of funds — from “Ethereum” to miners who perform blockchain validation work. In this view, ETH is the crypto instrument that is pumped from Ethereum through the little contractual arrows directly to the miners. In traditional contractual terms, the flow of ETH to miners can be thought of as compensation, consideration, payment, and so on. But as blockchain analysts know well, a PoW scheme cannot be reduced to something like unilateral payouts from an employer to employees, like rewards from a queen bee to an army of miner drones. Blockchain mining rewards are far more complicated, legally. The simplified framework above omits important PoW stakeholders. It is also flawed because it reduces a decentralized web of actors to a heuristic centralized body — “Ethereum” — which arguably lacks legal personality. In reality, Ethereum is a legal ghost (apropos Casper’s aspiration to ghost-like transcendence). Not only is Ethereum ≠ Ethereum Foundation in empirical terms, but when implemented well, nothing like “Ethereum” should even exist as a standalone legal entity. Incidentally №1: early on, Ethereum’s co-founders floated the idea of vaporizing the Ethereum Foundation by transferring its assets into an autonomous DAO, so legal personality issues of the sort we’re now analyzing have a long pedigree. Incidentally №2: as a more-or-less objective measure of success/failure, Ethereum’s legal personality (or lack thereof) is one of the best tests of the extent of Ethereum’s actual level of decentralization. The point about Ethereum stakeholders and legal personality is significant because vaporizing the ghost of “Ethereum” allows us to attack the putative contractual nature of PoW reward schemes. If there’s no legal entity at the center of a mining/validation hub, there can be no contracts between between the center and the radiating spokes. Thus far, we have discussed PoW/PoS networks as clusters of contracts without necessarily tapping into the contract law of X or Y jurisdiction, even though jurisdiction questions are ultimately existential ones for blockchain devs. At first, this may seem like an analytical bug, but in this context, it’s actually a neat legal analytical feature. This is because crypto legal analysis must be both jurisdictionally-agnostic and jurisdictionally-contingent. 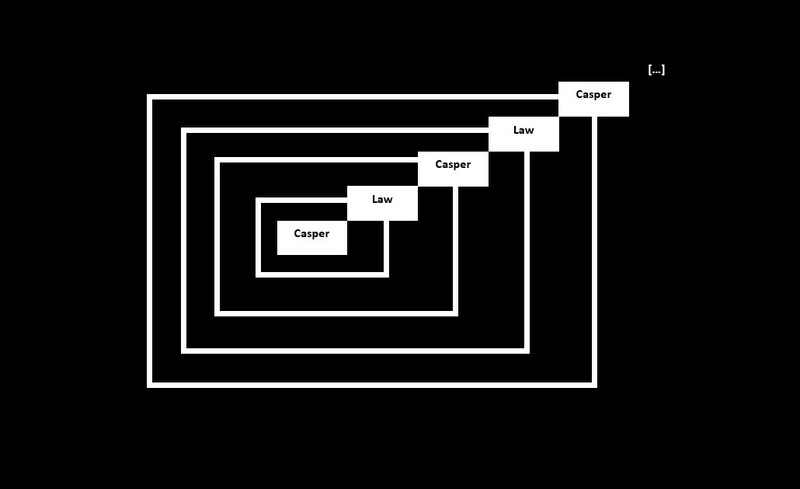 This reflects a standard legal analytical operating procedure, known in theory circles as legal realism (aka indeterminacy; comparative legal analysis; et al.). The basic idea is that one cannot get good legal analysis without first mapping the full range of possible legal arguments that can be made in support of, and against, a given position (subject to time, resource, and other constraints) — across an inherently fuzzy and pluralistic jurisdictional matrix. Jurisdiction questions already structure how Ethereum developers think about the transition to PoS. We just need to make the legal issues even more explicit. Please note, the jurisdiction question is not just about forums for resolution of disputes or the law that will govern those disputes. Acknowledging the operation of plural, overlapping, and conflicting jurisdictional authorities is a prerequisite to stronger substantive legal arguments and postures as well. It allows us to get comfortable with the fact that we cannot ever fully eliminate legal uncertainty and legal risk. Seeing the world as a jurisdictional Venn diagram allows us to ask narrow legal questions and obtain actionable sets of answers, some of which may be more dispositive (outcome-determinative) than others. Crucially, because global jurisdiction maps are dynamic Venn bubbles, answers to legal questions can never be 100% clear: there will always be overlapping gray areas. Our broader jurisdiction maps produce seemingly contradictory answers to supposedly straightforward questions, and that’s precisely why the broader maps are so valuable. Thus, returning to whether PoW schemes are contractual, we learn that the answer is both yes, and no — simultaneously. Crucially, these are not simply abstract or “theoretical” points. They are immediately operationalizable through the key intuition that the less contractual we make the Ethereum ↔ miner/validator relationships, the greater the blockchain utility gains. The operating logic is simple: (1) contractual relationships entail contractual liability; (2) weakening contractual theories of obligation lowers the likelihood of contractual (and, potentially, quasi-contractual) liability; (3) lowering contractual liability opens up more time and funds for development. The same logic should inform the transition to PoS as well. 6. Ethereum ↔ Miner/Validator Contracts? Let us dive deeper to see how blockchain developers can weaken centripetal contract bonds in order to strengthen the system as a whole. Although a contract is a legal ghost, one can’t form a contract with a legal ghost. That’s too many ghosts. You can only have a contract with a legal entity capable of entering into contractual relations. If the global public blockchain is not a legal entity, then it cannot enter into contracts. It’s as simple as that. 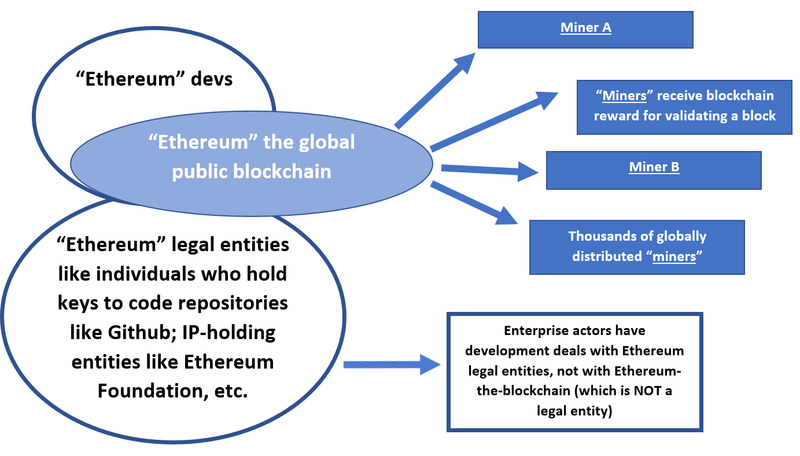 Here is the same map as the one drawn above, now with additional legal actors that fragment “Ethereum” into more granular constitutive parts. Please note how the express reintroduction of legal stakeholders serves to vaporize the legal ghost of Ethereum-the-blockchain. Three additional factors are useful in this regard. 6.A. Who’s Ethereum? Where’s Casper? On the contrary, to the extent these contracts bind any Ethereum-related legal entities, these entities are distinct from Ethereum-the-blockchain. This may seem like an obvious point, but it bears repeating and accentuating — particularly in the transition to PoS. Second, we can further weaken the potential contractual nature of the Ethereum ↔ miner relationship by recalling that miners obtain block rewards from other blockchain users, not from Ethereum-the-blockchain. But a better representation of consideration flows in a PoW setting is to imagine the miners transacting between themselves and a global base of users, separately from Ethereum-the-blockchain. Ethereum 1.X and Ethereum 2.X are just the bundles of software that private transacting parties use to do business. With respect to liability for transactions that happen on the Ethereum blockchain, Ethereum should be viewed more like Microsoft Windows (or, say, Apple FaceTime, or Mozilla Firefox), rather than a centralized software vendor like TurboTax or Facebook. Third, contractarian approaches PoW blockchains omit the reality of miner cartel formation, or what is colloquially known as “pool mining.” In a nutshell, pool mining wrinkles the idealized blockchain vision of democratic, ubiquitous, and decentralized transactional space-time. Here is a visualization that finally introduces mining pools and crypto exchanges to our working legal map of the Ethereum ecosystem. To see how mining pools and cartels distort supposedly liberal blockchain markets, we encourage everyone to read Vlad Zamfir’s 5-part introduction to Casper, dig into industry-best empirical work on forkonomy by Parallel Industries, and/or just tag Oliver Beige on Twitter. The key point from the last diagram is that the folks in the bubbles on the left (blockchain devs) are our first and last line of defense against the excesses of the folks in the bubbles on the right. At this stage of blockchain’s development, liability regimes should afford blockchain developers the greatest possible freedom of action because blockchain developers are already directly incentivized (financially, reputationally, …, and also, legally [see above]) to guard their blockchain networks from external and internal threats. The transition to PoS is not a liability-shielding exercise; it is a security maximization move. In this context, lower liability translates to greater security through much greater utility. Our brief overview of the transition from PoW → PoS focused on foundational legal issues in order to anticipate potential legal attack vectors. Before closing, we should recall some of the bigger design objectives common to Ethereum PoW & PoS. Provide legitimate governance mechanisms that accomplish #1 to #4 in a sustainable and socially-meaningful manner. This is not an exhaustive list. In addition to these broad goals, we can see that stakeholders in global public blockchain projects like Ethereum have many other competing objectives and interests. Despite major conceptual, personnel, and market shifts, Ethereum PoS seeks the same heights as Ethereum PoW — to build a censorship- and capture-resistant data structure and socio-legal marketplace. It is not clear how (or even if) Ethereum 2.0 will get there, but it is clear that global public blockchains will continue to grow and evolve. At least one global public project will fulfill the promise of a general-purpose globally-scalable mass-adopted blockchain: the potential utility gains are just too great to let status-quo-favoring lawyers destroy the emancipatory dream. We see many reasons for optimism in excellent analysis by folks like James Prestwich (his highly-analytical primer on Ethereum 2.0 is a must-read), the non-stop constructive “nitpicking” by Vitalik Buterin, and excellent grassroots efforts by many prominent blockchain thinkers to refine the economics of staking, improve governance processes, and optimize security outcomes in anticipation of Ethereum’s move to PoS. In our next installment, we will analyze one of the most significant differences between Ethereum 2.0 and Ethereum 1.0. This is, of course, bETH, the planned network token for the Ethereum 2.0 blockchain. As a novel form of a non-tradeable staking-utility token, bETH has the potential to emerge as a sui generis legal form — far outside of traditional security token v. utility token binary taxonomies. bETH is rich in complexity and we can’t wait to share our initial findings and analysis. Beyond bETH and the issues above, there’s a clear need for more legal research around PoS. We encourage everyone to think about the global spectrum of most-optimal ↔ least-desirable legal frameworks for blockchain staking, across jurisdictions. We need many more voices from around the world to illuminate the legal aspects of these complex social consensus-building problems. For now, we hope you agree that, PoW or PoS, crypto scaling is also a legal problem in need of innovative legal solutions. If you agree, please share our work and sustain it. It is far easier to take action today than to support future armies of lawyers to fight battles that you could have prevented.